The first publication of the Canberra Speculative Fiction Guild is still available. Artificial Intelligences, Wyverns, Werewolves, Yowies, Elves, Dogs, Alien Possums and ... Others. 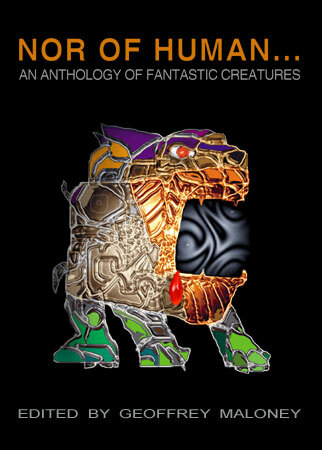 Captured in these pages are stories of fantastic creatures from the minds of the Canberra Speculative Fiction Guild. These stories represent gems from award winning, established and emerging writers. Nor of Human... is a rich blend of humour, horror, hard SF, Fantasy, space-ships, elves, and everything between. Including Marmosets. Nor of Human... is the work of 16 talented authors, editors and illustrators working in or around the ACT region of Australia. can be ordered from Dreamstone by clicking HERE. If you live outside Australia, do not wish to use a credit card, and still wish to order the anthology, I will accept US$13.00 in stamps (includes freight). Bank charges on international cheques are prohibitive.